In 2014 I was commissioned by Professor Helen Dawes of the Movement Science Group at Oxford Brookes University to assist her team and partners in devising how to engage patient perspective in the creation of a new rehabilitation feedback tool for survivors of Traumatic Brain Injury (TBI). The project was a small part of the huge CENTER-TBI project funded by the EU and composing over 120 partners in 27 different countries. The team wished to create a tool that would both generate useful data for clinicians and researchers as well as being useful to the survivors themselves. I was asked to help devise a strategy for engaging patient perspective and exploring its potential for the researchers who would create the tool. 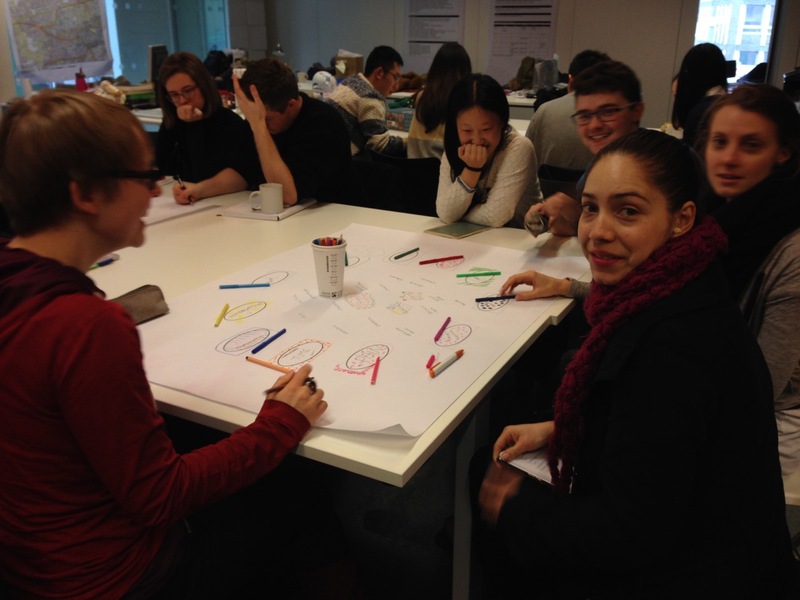 To a degree this was a matter of introducing the concept and some processes associated with user experience (UX) into a medical context. Whilst it might be assumed that this would be a natural fit, it was shocking to discover how alien the concept actually is of engaging patients in designing the process for monitoring and evaluating their own condition. It seems that it is a much more standard practice to ‘design out’ patients from the business of gathering objective data about their condition in case they contaminate it in some subjective way. What I found exciting about this project was its leader’s desire to do something different, to approach the problem of gathering data about survivors’ experiences of rehabilitation in a more nuanced and engaged way, whilst still aiming to acquire ‘clean’ data that could be used by clinicians. For this to be the case we would have to negotiate a space that the tool could occupy which would satisfy the motivations of clinical researchers at the same time as offering some return that could engage the ongoing motivation of a TBI survivor to use it to regularly contribute data. Despite the vast scale of the CENTER-TBI project as a whole (around €29m) the bulk of the funding is targeted at acute care, with around just 1% associated with rehabilitation. This project was part of that tiny fraction and consequently very limited, with my involvement being one of the smallest parts. To use this resource effectively and impart human centred design principles into a development team unfamiliar with the practice I had to devise a method of engagement that would highlight the issues and problems of not engaging survivors in the design process, so that the development team would naturally arrive at an understanding of their own; so that they would appreciate the value of actively engaging users in planning the design of the tool to avoid unnecessary pitfalls and respond to the capabilities and capacities of the people intended to both use the tool and benefit from it in some way. The process I devised involved facilitating an initial co-discovery workshop for project team members (clinicians and researchers), followed by a co-design workshop matching team members with people with TBI at a local Headway centre in Oxford. The first day-long workshop took place at Oxford Brooke’s in April 2014. I had invited a colleague, David Sinden, to co-facilitate the workshop with me. David is a photographer and artist, as well as an experienced media producer and curator – more specifically he has direct experience of surviving a traumatic brain injury himself, having suffered a sub-arachnoid haemorrhage in 2002. We had worked together in the early 2000s and I knew that David would bring a unique understanding not only of the issues facing a TBI survivor, but would be able to do so within the context of the needs and requirements of media production. Also part of the project team was Dr Lizzie Coles-Kemp of the Information Security Group at Royal Holloway, with whom I previously collaborated on two other engagement projects. 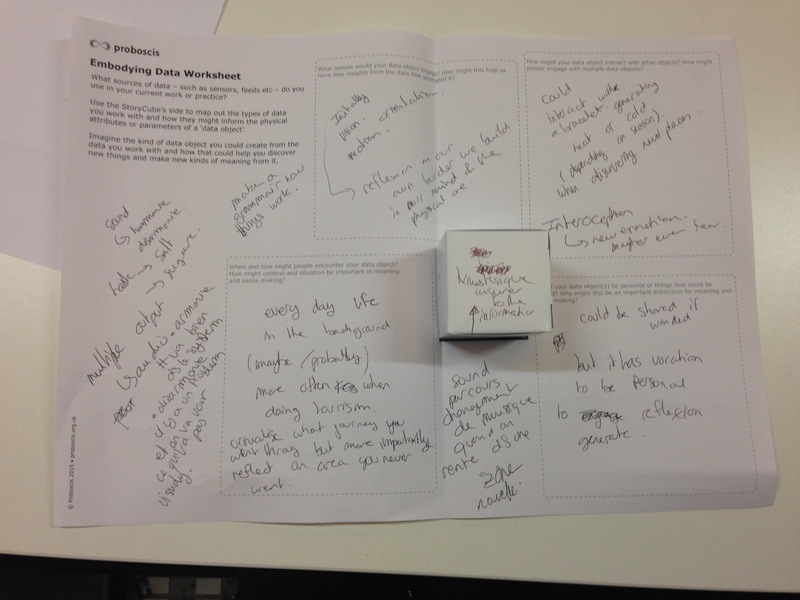 The workshop was subsequently documented in a bookleteer book, including post event feedback from the participants, to enable its results to be more widely shared. 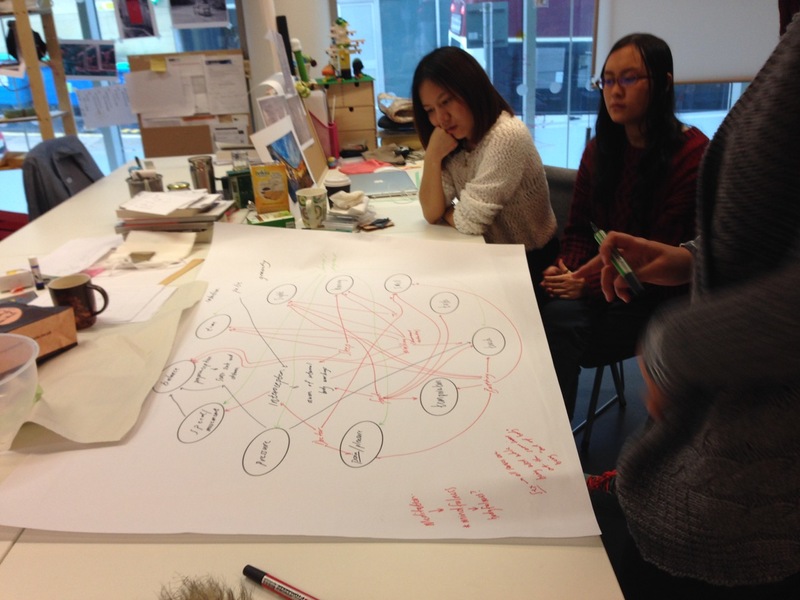 The book included visual annotations of the day’s discussions drawn by Proboscis associate, Mandy Tang. 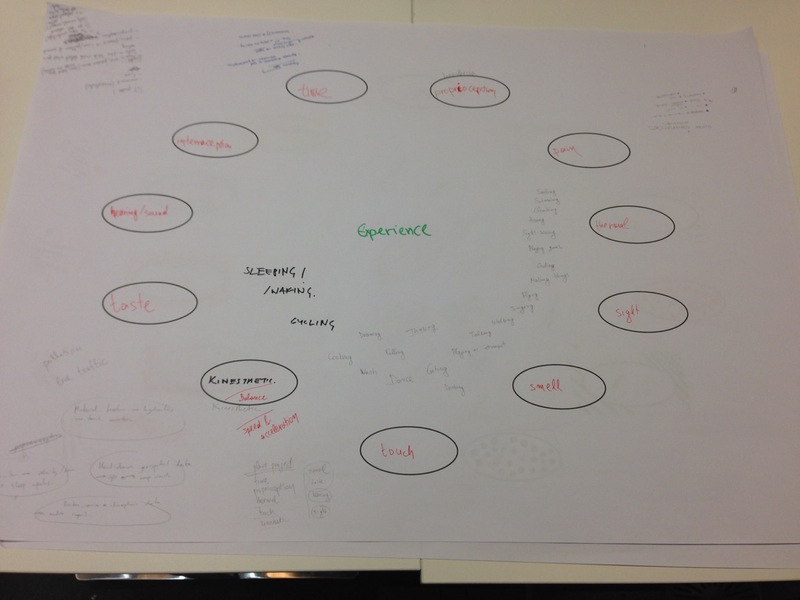 The second workshop took place in late July at the Headway Oxford centre. I had devised a simple paper-based tool for the participants (five TBI survivors) to map their own rehabilitation journeys through a creative process, assisted by Headway volunteers and project team members. 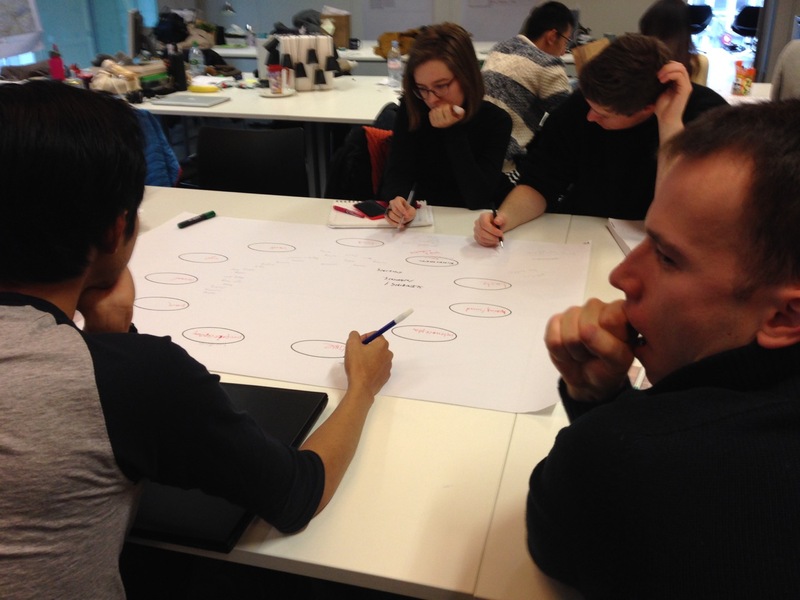 The aim of the workshop was to reveal the nature of the complexity and challenges for user engagement in the design of a rehabilitation tool by actually doing the task itself in a paper-prototyping fashion. Two of the Oxford Brooke’s development team took part and were able to experience first hand for themselves the kinds of capabilities and capacities that TBI survivors cope with. 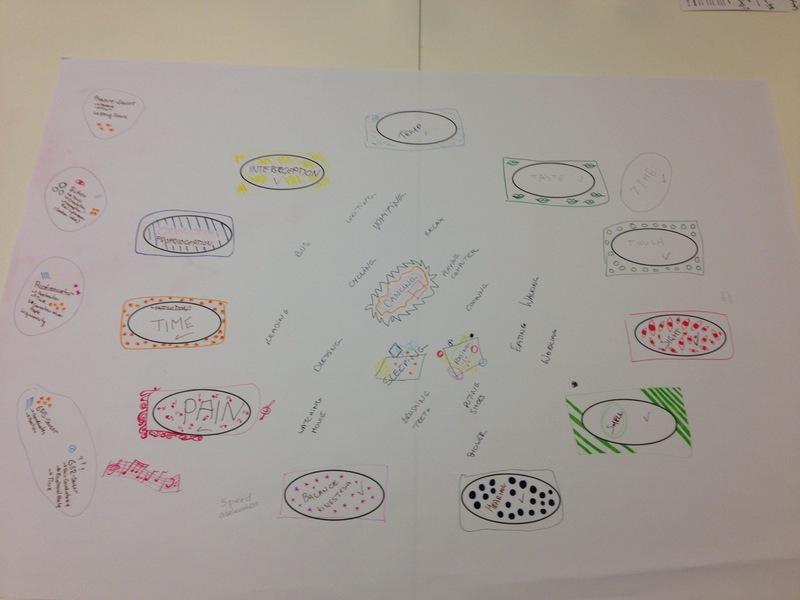 The exercise was designed to be a simple as possible, asking the participants to just use words and simple drawing techniques to describe aspects of their rehabilitation journey. Yet not one of them felt confident enough to do the writing or drawing themselves and relied on a volunteer to help them. The group completed the tasks individually, yet openly discussed the questions and helped each other ‘remember’ things. The value of mutual support in recalling and recording individual experiences was firmly underlined. 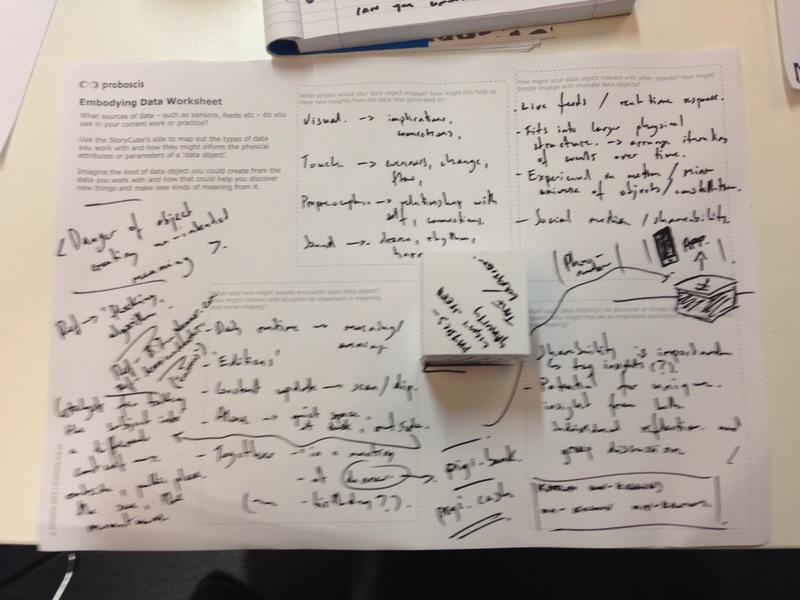 The workshop revealed to the researchers some of the considerable engagement and user experience issues which they would have to address before any tool – digital or analogue – could be used in the field. For myself it was inspiring that the TBI survivors at the workshop found the exercise to be useful in itself, and could see the value in repeating it on a regular basis – both as a bonding exercise with other survivors and to help recognise and understand patterns in their own lives. Unfortunately I have been unable to find additional funding or resources to enable me to develop the paper-based TBI engagement tool further. I hope to find an opportunity in the not too distant future to create a version of this tool that could be used by TBI survivor groups themselves as part of their rehabilitation process, recording and reflecting on their experiences, helping each other discover or keep track of patterns that affect them. This entry was posted in Workshops and tagged engagement, experience design, patient perspective, rehabilitation, TBI, traumatic brain injury, user experience, workshop on July 30, 2015 by gileslane. Since launching bookleteer.com – a unique artist-created self-publishing platform – back in 2009 I have devised and led a variety of workshops to introduce people to the concept of public authoring and self-publishing using hybrid digital/physical formats. The workshops have gone under various guises and names over the years, the most recent being “pop up publishing”. In 2014 I led a series of such workshops for the general public in public libraries in 3 London boroughs for the LibraryPress project, and have subsequently given similar formal and informal workshops, masterclasses and training at other places and venues. What are hybrid digital/physical formats? Bookleteer allows people to create and share publications that are both digital and physical; publications can be read online via a book reader version [example] or downloaded as a PDF, then printed out on a standard home/office printer and hand-made into a physical book [example]. Bookleteer also offers the ability to have books printed and bound professionally at low cost [example]. 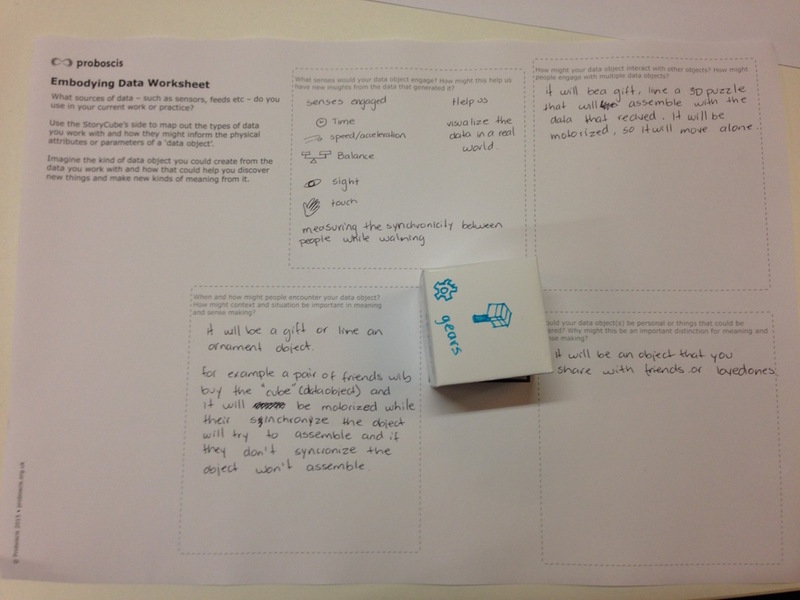 It also allows people to create and share StoryCubes of their own designs. Traditionally the publishing of a book is the endpoint of a creative process, but we feel this does not have to be the case. One of the key ideas behind bookleteer is that publishing can be more like an evolving conversation, not just an authoritative statement or full stop. Our platform allows people to create and share publications with ease and speed, updating or creating different versions at will and at no or negligible cost. A bookleteer publication might be created simply to be read online, or it might be intended as a highly personal one-off handmade book as a gift to someone special. They can also be professionally printed and bound in editions of 25 copies and more. A publication could be a collection of stories, poetry or a photobook. 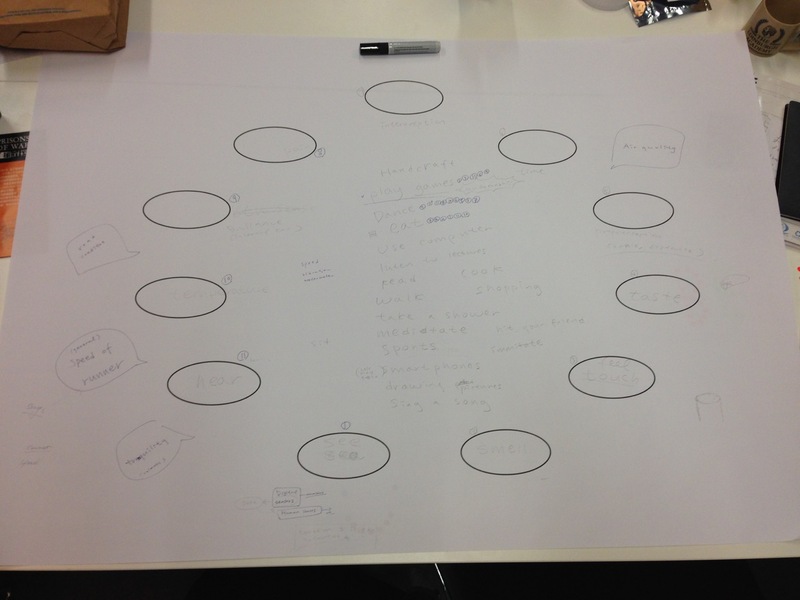 It might document a workshop or group activity – helping retain the experiences and learning of the group in one place. It might be a personal travel guide or a manual, a notebook or sketchbook. Whatever uses you can think of putting a book form to, bookleteer can help make simple and accessible. Our unique book binding format and hybrid publishing model is designed to facilitate publishing on demand – lowering the barriers to making and sharing for anyone, anywhere. I have used these books and bookleteer in countless projects with diverse communities across the world. From working with academics and researchers, technologists and scientists to grassroots communities in the UK, Canada, Europe, Brazil, Japan, Australia and with traditional villagers in the remote jungle of Papua New Guinea. 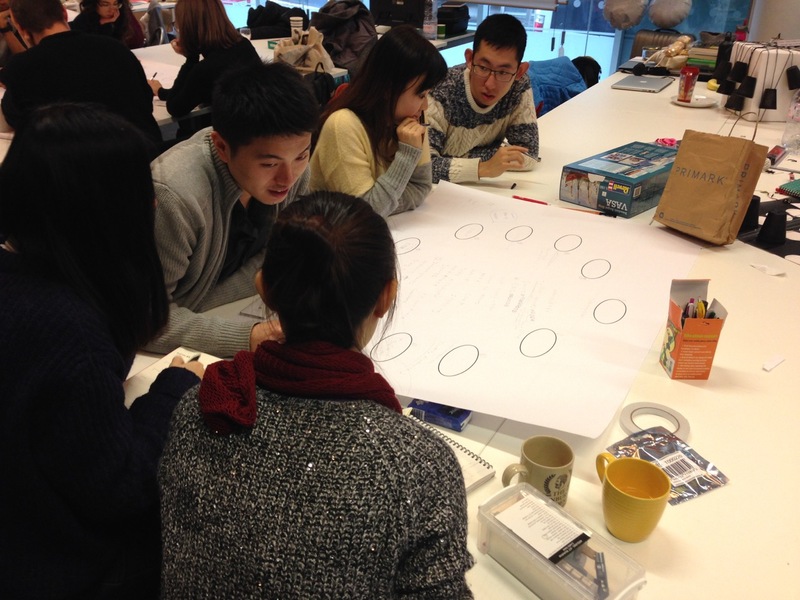 This workshop is easily adaptable to different groups and contexts. It is relevant to all walks of life where there is a need or desire to create and share publications (corporate, academic, cultural or otherwise). Please contact me for prices and bookings. An introduction and practical session takes at least 3 hours for groups of 10 to 30 and can be run as a half or full day workshop as desired. It is suitable for a range of abilities and levels of expertise – no previous experience of desktop publishing is necessary. This entry was posted in Workshops and tagged bookleteer, public authoring, self publishing, workshop on July 23, 2015 by gileslane. 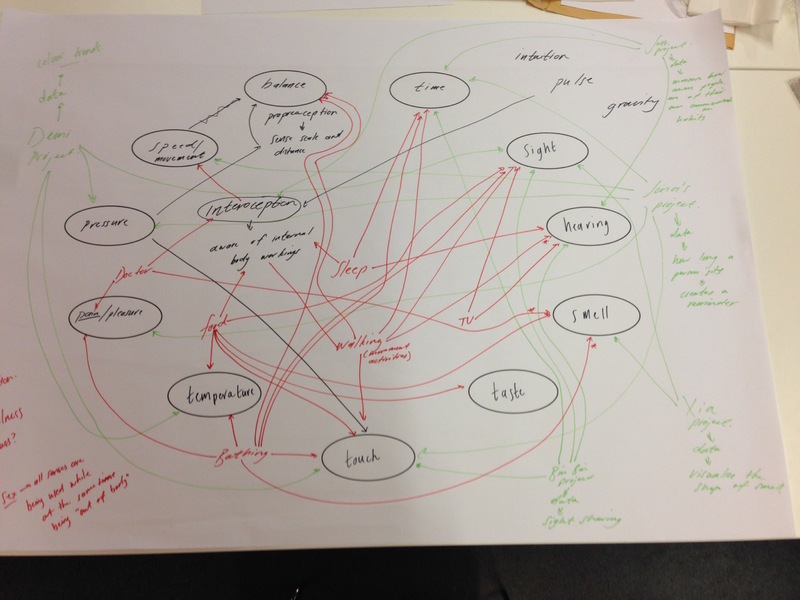 Last week I was in Edinburgh to run my co-discovery Embodying Data Workshop with 24 of Chris Speed‘s Design Informatics Masters students at the Art College. The workshop was devised a few months ago as part of my Creativeworks residency at Birkbeck College to introduce computer scientists to the possibilities of approaching the problem of data analysis and computation differently by manifesting data in tangible ways. Thus we may bring more of our human senses to bear on meaning making than merely relying, almost exclusively, on vision and hearing as with standard data visualisation techniques. It is a hands-on workshop using paper-prototyping methods to explore manifesting data as physical objects – why would we do this? what sort of objects? how could it benefit data analysis and computation methods? – and is an opportunity to speculate on how we might discover new ways to generate insights into complex data sets to discern previously undetected patterns and make meaning. The workshop starts off by engaging the participants in identifying 11 major human senses (touch, taste, smell, sight, hearing, temperature, balance, pain, time, proprioception and interception) and discussing other sensory factors. Then we begin to map how many senses we actually use in everyday activities and tasks. In this way it becomes apparent how reliant we are on multiples senses to interpret our experiences of the world around us. How much then are we missing in trying to analyse data using just our visual and occasionally auditory senses? What patterns might also exist that we are simply not able to perceive because the senses that would detect them are not being activated? The last part of this exercise asks the participants to think about data sources and types, such as different kinds of sensors or data feeds/streams as well as the kinds of data coming through – energy use, health, environmental, sales, traffic, communications etc. We then follow on by mapping how we might interrogate such data using additional senses to sight and sound. What benefits might we get from having new ways to explore big and complex data sets? What could happen when we take digital data out of the machine and into the physical world? This exercise is followed by a short presentation on Proboscis’ Lifestreams project: how and why we developed the life charms from biosensor data and what implications we believe it has for creating new insights into health and fitness data for wellbeing. Lifestreams provides both an actual context and talking point to discuss the difference that embodying data in the physical world – making it tangible to the senses – could have. 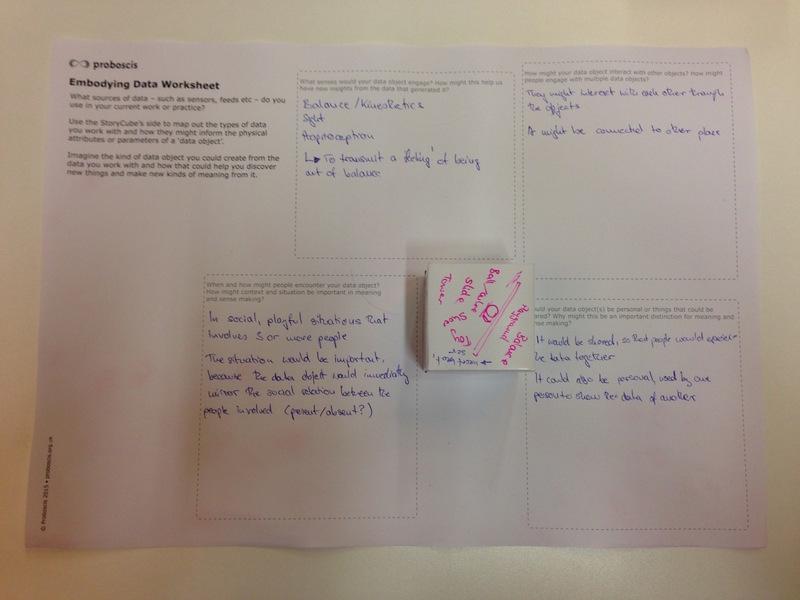 The second workshop exercise involves each participant using a blank StoryCube to imagine a data object of their own. 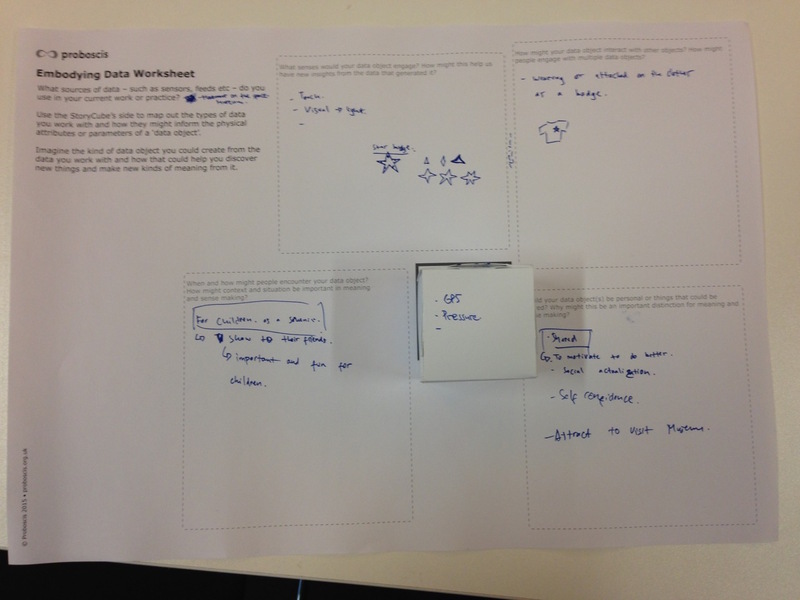 I encourage them to use the 6 sides of the cube to indicate data types or streams that they might be using in their existing work or projects which could be used to generate a hypothetical data object. 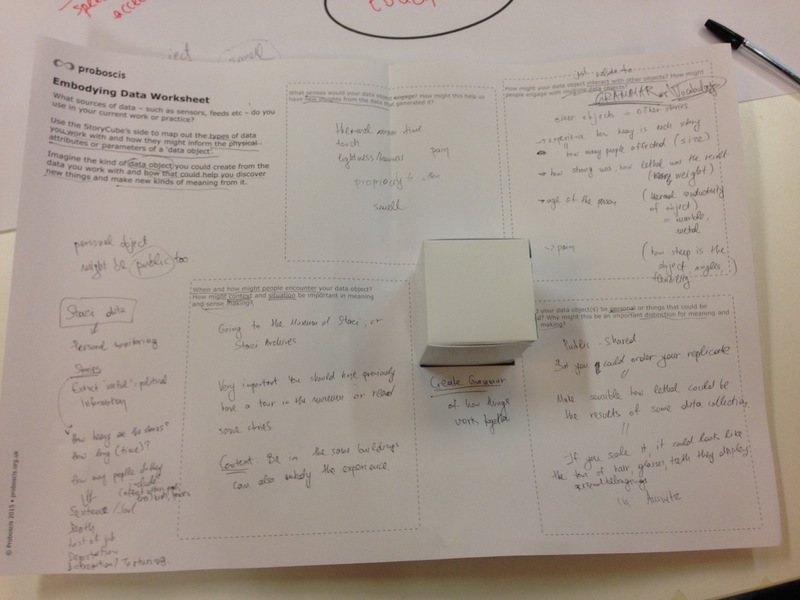 Then, placing their cube on a worksheet, the participants are prompted to consider how their data objects would connect with different human senses; how the objects might interact or connect with each other; whether they are personal or shared objects; what kind of conditions might people encounter them in. Participants are encouraged to consider what implications may arise from all these too. 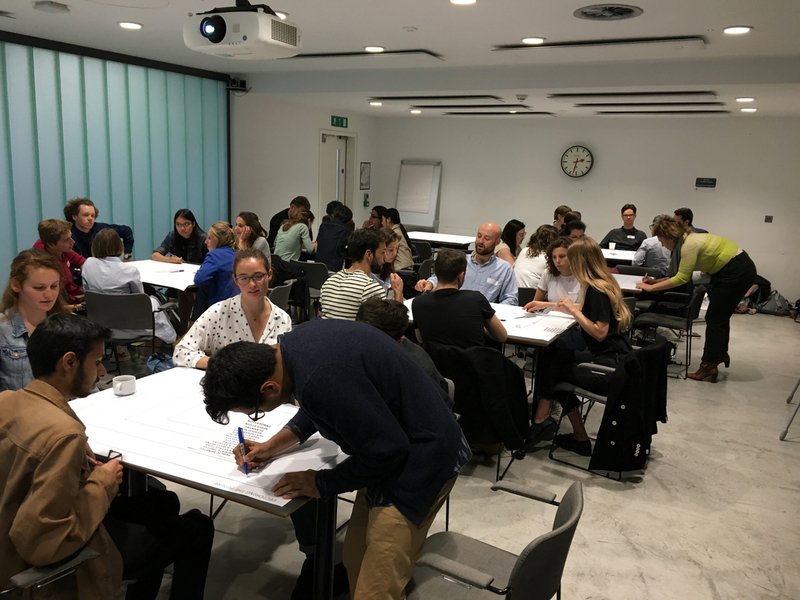 Finally we discuss the ideas that have emerged from the exercise and, more generally, the potential for new insights into complex datasets to emerge from creating the possibility for senses other than sight and hearing to be involved in analysis. The point of the co-discovery workshop is to allow participants to come to their own understanding of the potential and what might be possible, not to be didactic. It aims to plant a seed of curiosity by exploring the gaps and absences in our toolkits for creating new kinds of knowledge, hopefully to inspire entirely new ways of expressing data in physical or environmental forms such that we can move beyond the ghetto of the primacy of the screen. I am available to deliver the workshop to other groups (academic, cultural or corporate). Please contact me for prices and bookings. The workshop lasts about 3 hours, is suitable for a range of abilities and works best with groups of 10 and more. It has been designed to engage scientists at both postgraduate student (Masters/PhD) and professional staff level (lecturer/researcher). It works equally well with designers, artists and others who are also exploring the use of data as a creative material/medium. This entry was posted in Sharing Stories, Workshops and tagged data manifestation, data visualisation, embodying data, lifestreams, senses, tangibility on January 20, 2015 by gileslane.